I was very sorry to hear of Heathcote’s passing, and that I missed the funeral. Will there be a memorial service in the future? I would love to connect with Diana and their children to express my condolences. I knew them years ago and have some wonderful interesting memories of them. When I knew them, China was a lovely young child and I think that Lily had yet to be born. Charlie, I believe, came later. Heathcote was in the West London area at the time at the height of Flower Power, Squatters’ Rights and the Windsor Free festival. I was friends with Nicholas Albery too who, I believe, may have started Gentle Ghost Removals, among other organizations. I contributed to the White Lion Free School in Islington at the time, which catered for children with school phobia. There were so many ‘causes’ to chase and support. I was with May Hobbs and the Night Cleaning strikes, and fighting for Equal Pay for Women. 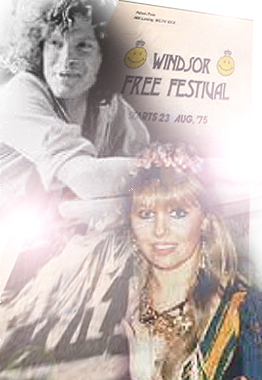 I sat in court with many others when Heathcote and Diana sued the police for damages and substantial loss of hair when they were mistreated at The Windsor Free Festival. Nicholas went to court too dressed as a magician in a great pointed hat with stars and moons all over his cloak. I believe Diana won her claim, but alas, Heathcote lost. He sent roses to the Judge at the time who had gone to the same school… and was an ardent rose gardener. He implied that the roses were from Diana and the thorns from himself. Unfortunately, it was viewed in a dim light, and Heathcote ended up doing community service. He proceeded to dig up the paving stones in Oxford Street and planted rose bushes to the delight of the people and the consternation of the authorities. Heathcote was wildly intelligent and a great ambassador of the creative movement of the time. Everyone wanted to hear his poetry and see his works. The first time I met him I thought he had a designer pair of grey Argyle socks on him and commented on the beautiful wavy patterns. He told me he had just come from a music festival and that nature had designed his bare feet with paintings of rivulets of rain and dashes of mud. I was delighted to hear this. I attended the Royal Court upstairs theatre for his brilliant rebellious production of AC/DC complete with projected graphics. Someone tapped me on the arm and a joint was passed down the line. I looked into the smiling eyes of Warren Mitchell from Till Death Us Do Part. I didn’t see him puff it but it did get passed on and it did make me smile. These were great days of major changes in society… the fashioning of a new era of freedom… and Heathcote was at the forefront, one of the pioneers who was not afraid to speak his mind and regardless of restrictions make new pathways. He cared for nature and the creatures of the Earth. His premise was Love and Let Live… a truly remarkable soul in this century, full of spontaneous wit and magic. My only regret is, that in my travels. I did not manage to stay in touch with the family, but all through the years I have been aware of his literary work and I am a collector of his writings, especially those beautiful studies of the creatures of world. Travel well, Heathcote…you are certainly in the Light. We won’t forget you. Thank you, Claire, for writing to me. I am so sorry I did not get to meet up with him again… and then to discover he was just down the road in Oxford. I believe that Heathcote may have known my dear recently departed friend Terence DuQuesne. I would love to talk with Diana. Please pass on my regards and my contact details to her. It has been five years since Robin left the body and the grief still comes in waves but there is no cure after knowing and loving someone for a long time. One just has to go with the flow. We are never given more than we can bear, and it is better coming in waves than all at once. My condolences for your own loss, Claire. I recently lost my mother who was 93 years old. So another batch of waves has set in. In Ireland they say that Death is nothing but the middle of a long life. I rather like that thought. This entry was posted on 20 July, 2017 in homepage and tagged Claire Palmer, Dwina Gibb, Heathcote Williams. Bookmark the permalink.